Here's my ten minute movie review of the new summer comedy from director Shawn Levy (NIGHT AT THE MUSEUM) and stars Owen Wilson and Vince Vaughn. It would be easy to be cynical about the laziness of reuniting the stars of THE WEDDING CRASHERS as essentially the same wise-cracking characters in a narrative that bears no small resemblance to DODGEBALL: A TRUE UNDERDOG STORY. But I have to say that I was entirely won over by this loveable, touching, laugh-out-loud funny and actually pretty intelligent movie. Also, it's not all old-hat - newcomer Max Minghella totally steals the show as the obligatory douchebag. THE INTERNSHIP has a rating of PG-13 in the USA and a running time of 119 minutes. 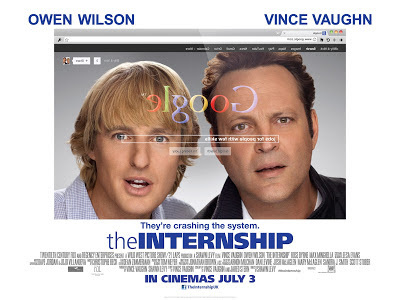 THE INTERNSHIP is on release in the USA, Australia, Bahrain, Hungary, Lebanon, New Zealand, Portugal, Bulgaria, Estonia, Lithuania, Serbia, Russia, Colombia, Poland and Sweden. It opens this weekend in Belgium, Egypt, France, Bosnia, Croatia, Greece, Israel, Macedonia, Slovenia, Romania, Spain and Taiwan. It opens in the UK, Ireland and Norway on July 3rd; in Denmark, the Dominican Republic, the Netherlands, Finland and Turkey on July 12th; on August 2nd in Mexico and Ecuador; on August 9th in Bolivia and Uruguay; on August 22nd in Argentina, Singapore and Venezuela; on August 29th in Peru and Brazil; in Germany on September 19th; and in Chile and Italy on September 26th.